Do you run a services business and want to give your site visitors an easy way to request a quote from you? Being able to give customers an idea of what they can expect to pay for a service you provide is helpful for establishing contracted work between you and your clients. In this article, we’ll show you how to create a request a quote form in WordPress. Limited Availability – If you’re an owner operator, you may not be available to answer the phone all the time. This can lead to lost sales opportunities. Lack of Details – Sometimes you need specific details to prepare a quote, which can require multiple phone calls back and forth with the client. This can be frustrating for both sides. No Records – Unless you use a CRM, it’s hard to keep records of communications. You might end up losing money because of this disorganization, which hurts your bottom line. That’s why smart business owners use a request a quote form to automate processes and grow their business. With a request a quote form, you can get specific information from potential clients and use smart logic to tailor the form based on user’s needs. This will improve customer satisfaction and boost retention. You can also automatically integrate your form with an email marketing service to close more deals, build a bigger email list, and grow your business. Now let’s take a look at how to create a request a quote form in WordPress with a plugin. 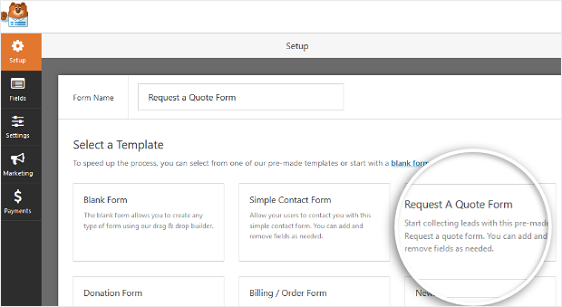 On the setup screen, name your form and select the Request a Quote Form template. 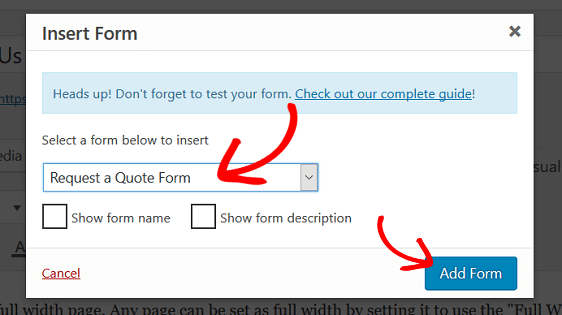 WPForms will create a request a quote form. Here, you can add additional fields to your quote request form by dragging them from the left hand panel to the right hand panel. To customize the form fields, click on them to make changes. You can also click on a form field and drag it to rearrange the order on your request form. 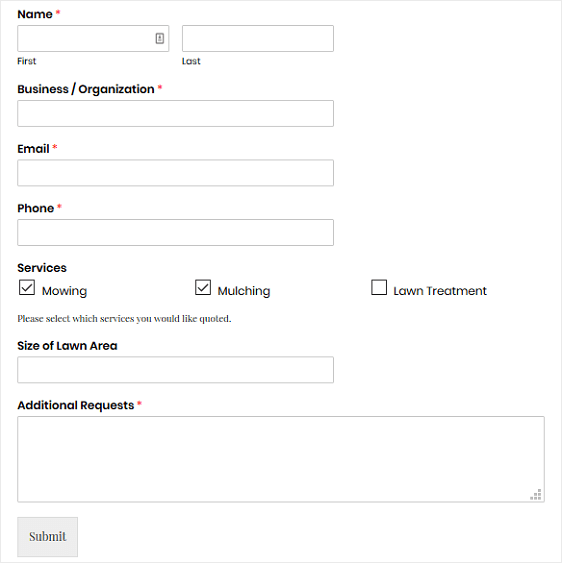 For our example, we’ll create a request a quote form for a landscaping business. 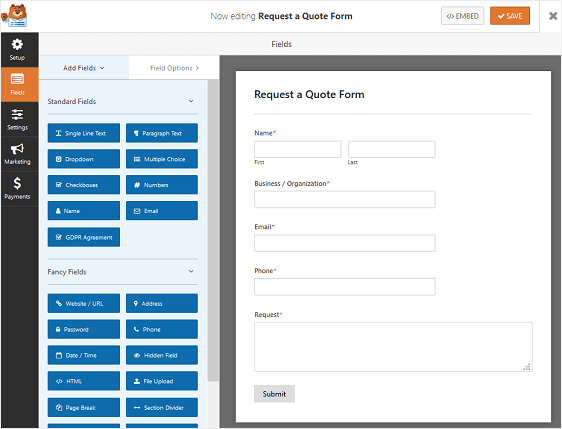 WPForms allow you to gather all the information you need to create a custom quote for your customers. 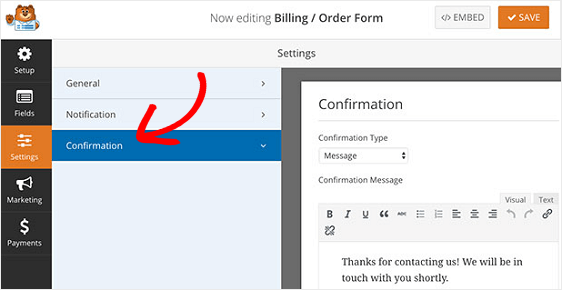 To help you with some common customizations you might want to make to your quote request form, we’ll first show you how to add checkboxes to it so customers can select which services they want quotes for. For our landscaping business example, we’ll add a checkbox for services like mowing, mulching, and lawn treatment. If you have a lot of service options for people to pick from, and want to split your checkboxes into several columns, go to Advanced Options and pick your Choice Layout to be 1, 2, 3, or inline columns. This will make your form more organized and prevent form fatigue. Now for some people, this is all they’ll need. If that’s true for you, then simply save your form and skip to configuring your fomr’s settings. However, if you want to reduce the size of your form because it’s long, then you can enable smart conditional logic to help streamline the process of filling out your WordPress request form for potential customers. WPForms smart logic allows you to show or hide form fields based on what the user selects. This is extremely helpful when you need additional information to prepare the best estimate, but don’t want to bog down site visitors with form fields that don’t apply to them. For our landscaping example, you’ll need to know the size of the lawn area in order to provide the best quote for some of the services you provide. To start, let’s drag a Single Line Text form field to your form. We’ll call this field “Size of Lawn Area.” You can change the label based on your request a quote form needs. Next, go to Advanced Options » Conditionals under Field Options. Click the box labeled Enable conditional logic. From here, you can choose to show a certain field if it meets your user’s requirements. In our example, we have chosen to display the “Size of Lawn Area” field if the user has selected the mowing services. Add as many criteria as you need to make your request for quote form make sense. Now we’ll look at how to configure your quote request form settings. To start, go to Settings> » General. Spam Prevention. Enable the anti-spam honeypot feature to prevent spambots from submitting faux requests. This feature is automatically enabled on all WordPress forms. If you decide to use another form of spam prevention, just unclick this option. GDPR Enhancements. Disable the storing of entry information and user details, such as IP addresses and user agents, in an effort to comply with GDPR requirements. In addition, check out our step by step instructions on how to add a GDPR agreement field to your request a quote form. Notifications are a great way to send an email whenever a request for a quote is submitted on your website. Unless you disable this feature, whenever someone requests a quote from you, you’ll receive a notification about the request. You can disable this if you want to. If you use smart tags, you can also send a notification email to the user when they submit a request for a quote. This will let them know their request has been received and that you’ll be in touch soon. It will also include any details they entered on the quote form. For more help with this step, check out our documentation on how to set up form notifications in WordPress. If you want to keep branding across your notification emails consistent, you can check out this guide on adding a custom header to your email template. Form confirmations are messages that display to users immediately after they submit a request a quote form on your website. They let people know their form has been processed and gives you the chance to let them know what the next steps are. Message. This is the default confirmation type in WPForms. When a site visitor submits a request for a quote form, a simple message confirmation will appear letting them know their form was processed. You might thank them for their request and let them know you’ll be in touch. Look here for some great success messages to help boost customer happiness. Show Page. This confirmation type will take site visitors to a specific web page on your site thanking them for their form submission or telling them what to do next. For help doing this, check out our tutorial on redirecting customers to a thank you page. In addition, be sure to check out our article on creating effective Thank You pages for boosting customer loyalty. To set up a form confirmation, click on the Confirmation tab in the Form Editor under Settings. Next, choose the type of confirmation you want to create: Message, Show Page, or Go to URL (Redirect). For our example, we’ll select Message. Now it’s time to add your request a quote form to your WordPress website. After that, publish your page and view it. And there you have it! You now know how to create a request a quote form in WordPress for your site visitors to fill out. If you want add an official terms of service or disclaimer to your request a quote form, check out our documentation on how to add a Terms of Service checkbox to your WordPress forms. This helps ensure your users know exactly what’s in store for them when they submit a request for a quote from you. I am interested in wpforms request for quote for parts quotations. We have hundreds of parts. Is there a built in function for uploading a spreadsheet of parts info or does each part have to be listed “by hand” with the conditional logic feature as you are creating the form? Thanks! Hi Lynne! Thanks for thinking of WPForms to create your request-a-quote form. Unfortunately, uploading a spreadsheet and having a field auto populate from hundreds of parts would be a very complex task, and there isn’t really an elegant solution with WPForms at this time. There isn’t really an out-of-the-box solution for this situation that our team knows of and can recommend to you. We would recommend talking to a developer to create a custom solution for your form, if you’d like your fields to auto-populate with your parts list. I’m sorry we can’t be of further assistance in this case. Feel free to get in touch if you have any other questions about WPForms! does this plugin support uploading a file for translation to get a quote from the translation company website? It definitely does, Youmna! Here’s a tutorial on how to create a file upload form. You can add a file upload field to any form. Looks like a nice and practical add-on. Though, I am wondering if it is possible to have a quote request right away being sent to multiple companies? I want requests to be reviewed by let’s say 5 companies, and it’s up to them to contact the potential client with their quote. Wondering if this can be automated by e.g. CC or BCC email settings (so that the requests won’t just be sent to my admin email address). Yes, our forms can absolutely do this. 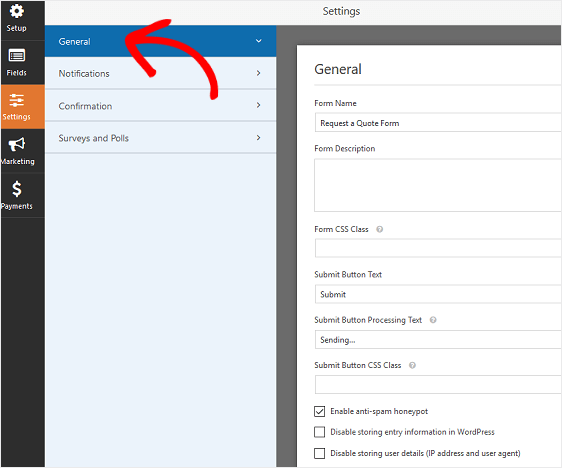 For details on how to add a CC field to notifications, you can check out this tutorial (under the section titled ‘How to Add a Reply-All Notification’). Or, to send a BCC-type notification you can actually just add multiple email addresses to the Send To Email Address field (marked in this screenshot). Any recipients added here will receive a completely separate copy of the email, without the ability to see other recipients. The last option is to send completely different notification emails to each company, which would allow you to customize the emails further. You can check out how to do that in the same tutorial I mentioned above. I hope this helps! If you have any other questions, could you please let us know? is there a way to provide customers a way to attach a picture to the request form? Absolutely! To allow users to submit images, you’ll just need to add a File Upload field (more details on that over in this post). The File Upload field is available with any paid license. We’ve also created a guide that answers all of the most common questions about file uploads. Would this work for a “build your own” quote function? I’d like clients to be able to pick and choose what they need of my design services, and be able to see the quote amount after submission. Sure! To set this up, you’d need to add smart conditional logic (available with any paid license). With that, you’d be able to display/hide different fields for users based on their selections. If you’d like the form to also calculate a running total for you, you can use payment fields for that. Here’s a tutorial that demonstrates how to do this in more detail (essentially displaying prices without collecting payment). Or if you’d prefer to do manual calculations for a quote you can follow the setup outlined in this tutorial and respond to the users individually. In this case, you’d receive the form notification email, then reply through regular email with the quote numbers. Is it possible to have a quote request sent to multiple companies depending on the postalcode of the customer to which supplier the quote will go? I want requests to be reviewed by let’s say 5 companies in at least the same Provincy as the customer lives in, and it’s up to them to contact the potential customer with their quote. Wondering if this can be automated ? It should be possible to set this up, but it could potentially be a bit complicated if you have a large number of Postal Codes to address. First, you’d need to have a standalone field to collect the Postal Code (it needs to be separate because if it’s part of a bigger Address field conditional logic won’t be able to ‘see’ it), or provide a dropdown field with options, etc. Next, you’d need to set up conditional logic for each notification option. Here’s a tutorial on how to set up conditional logic for notifications. This should help to clarify how exactly that would work. If you decide to try this, I’d also recommend creating an additional notification for anyone with a Postal Code that doesn’t fit the other logic — and then running some test submissions to be sure the logic covers everything a user might enter. it can be downloaded directly without sending e mail in pdf version ? Sure, you can download entries directly from your WordPress admin area. To do this, you’d just need to open the individual entry page, click Print, and use the browser option or other tool to save as a PDF. For all the details, here’s our tutorial on saving entries as a PDF. Is there a way to have the various data collection fields spread over multiple pages of the site but feed into one combined “contact”? i.e. if we want to ask just zip code first, then go into a descripton of our services, then ask later what type of services they need, then at the end, collect specific address, email, phone? We don’t have a way to piece together information collected in multiple locations on your site, however if your goal is to create a less overwhelming form, I’d recommend using a multi-page form. That way, you could ask just one question per form page (or any number of questions you’d like), and it’s less intimidating for your users. Multi-page forms can be created with any of our paid licenses. You could also consider using our Form Abandonment addon, which would allow you to collect entries even if the user doesn’t finish filling out the form. That way, you’d be able to follow up with more potential leads. Our Form Abandonment addons is included with our Pro license level or higher. hey! I have used this method but sir ! my Request form is not created can you help ! I have several products, each displayed on separate pages. I’d like to place an ‘Add to quote’ button to these pages. Customers pick a selection of these products, and ask for a qoute. So there should be an Ask For A Quote Page where all the chosen products are displayed together. Every product has a name (its page title), and an image (the featured image of its page) to be easily identified. There should be an option to remove any product from the list. Then customer fills the datas, and send the request. I hope I was clear about my needs. I apologize, but I’m not sure if I’m correctly understanding everything you’re describing. When you get a chance, could you please please get in touch with some additional details? We’d be happy to help further from there! I’ m using billing/ordering form . I want to know is there any plugin that show the customer order on front side and show invoice for they payed ? We don’t currently have a way to display order details/an invoice to a customer on demand, however you could easily send them a receipt or consider using invoicing software to generate invoice-specific formats. Some options, like Freshbooks, can even be integrated with your order forms. However, I apologize as I’m not sure I understand your second question. When you get a chance, could you please get in touch with some additional details about what you’d like to do? While setting up the quote, can I make it appear on a particular page only? I apologize, but I’m not sure I understand your question. If you’re curious about embedding a form, you can choose exactly where you’d like to do this on your site (here’s how our form embeds work). If that’s not what you had in mind, could you please get in touch with some extra details when you have a chance? How do I have the form (once filled out) sent to a specific email address…? To set up recipients for form emails, you’ll need to open the form builder and go to Settings > Notifications. Then you’d add these email addresses to the “Send To Email Address” field (for multiple emails, be sure to put a comma in between). For more details, please be sure to check out our notification email setup tutorial. I am working for a translation company that wants to integrate an easy-to-find, easy-to-handle option for potential customers to get in touch with the company. The customer must be able to submit a document, fill out certain information like personals and delivery options etc. This form should be visible in the header/ slider/ upper part of the website. Is this possible with wp forms? 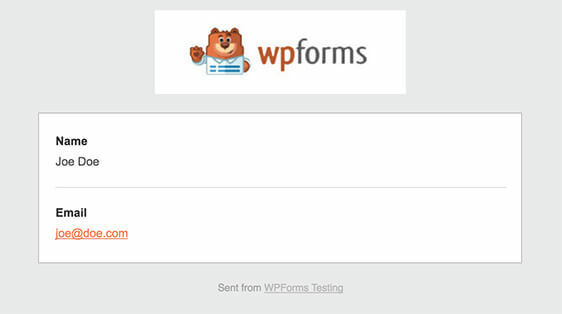 Yes, you can use WPForms to have customers submit basic information, along with uploading documents. Once you’ve created your form, you can imbed it anywhere on your WordPress site.